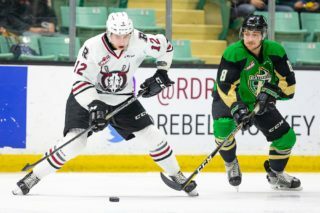 Blake Sydlowski knows what his role has to be if and when he gets into the Red Deer Rebels lineup as a full-time player. 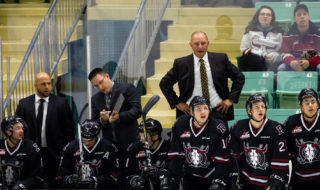 Ditto for Rebels GM/head coach Brent Sutter. “Just use my body a lot. I’m a physical guy, I like to get in the corners and grind it out, get to the front of the net and into the dirty areas,” Sydlowski said Monday. “He needs to be a guy who’s a real hard player to play against,” Sutter said of the six-foot, 198-pound winger. “He can skate, he’s strong and he’s got some decent skills. But it’s just that there’s an element that he still has to work on to get himself in the lineup on a regular basis. Sydlowski was listed by the Rebels two years ago after being passed over in the WHL bantam draft despite scoring 19 goals and collecting 46 points in 36 games with his hometown St. Albert AAA Sabres. “I felt confident I would be drafted so it was definitely disappointing when it didn’t happen,” he said. The 16-year-old — he turns 17 on Oct. 22 — attended the Rebels rookie camp in the fall of 2016, then went home and suited up with the minor midget AAA Flyers, with whom he excelled offensively with 26 goals and 69 points in 37 games. 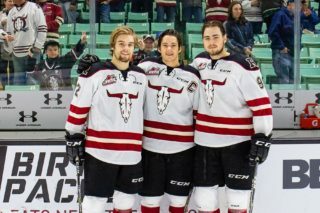 Sydlowski appeared in two preseason games with Red Deer in last year’s Tri-City tournament before being reassigned to the midget AAA Raiders. He went on to score seven goals and collect four assists in 35 games last season. “Last year I was more of a grinder, more of a physical guy,” he said. “I didn’t put up too many numbers but I was kind of like a leader and played a physical game. Sutter expects Sydlowski to play to his strengths on a more consistent basis in this, his rookie WHL season. “He wasn’t an offensive player in midget (AAA) but he’s a guy who can really skate. He’s strong, very well conditioned, and he has some good hockey sense,” said the Rebels boss. For now, at least, Sydlowski is just happy to be on the Rebels regular season roster. Sydlowski picked up two assists in four preseason games and is pointless in his two regular season contests. Despite presently being a reserve player, he knows he has to be ready to perform at a moment’s notice. The Blades suffered their first loss of the season, 4-1 Sunday at Prince Albert, and at 3-1-0-0 are tied with undefeated Brandon (3-0-0-0) and Red Deer (3-2-0-0) for fourth place in the Eastern Conference. Saskatoon is tied with Brandon for second spot in the East Division . 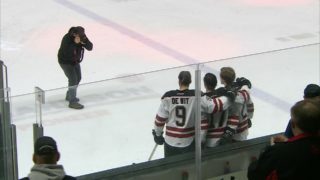 . . C Kirby Dach, a projected top-10 pick in next year’s NHL entry draft, leads the Saskatoon scoring parade with three goals and seven points. RW Max Gerlach follows with six points (4g,2a) and D Dawson Davidson (1-3-4) and C Eric Florchuk (0-4-4) are averaging a point per game . 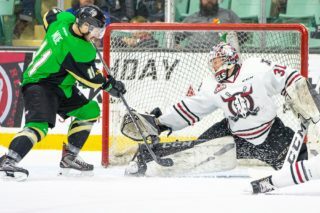 . . Nolan Maier is seventh in goals-against average — with a 2.13 mark — among WHL netminders who have played 120 minutes or more. He is 12th in save percentage at .909. . . . Florchuk was selected by Washington in the seventh round, 217th overall, of the 2018 NHL entry draft. Norwegian LW Kristian Roykas Marthinsen was picked by Washington in the seventh round of the 2017 draft, 213th overall. Injuries: Saskatoon — LW Kyle Crnkovic (upper body, 1-3 weeks). Red Deer — D Carson Sass (upper body, day-to-day). Special teams: Saskatoon — Power play 27.8 per cent, fifth overall; penalty killing 85.7 per cent, eighth. Red Deer — Power play 27.3 per cent, seventh overall; penalty kill 87 per cent, sixth.